The existence of certain amino acids, namely cysteine and histidine, as a dominant aspect of the “Morgellons” growth structure, appears to have been verified. This finding, along with that previously recorded on the important role that iron plays from a compositional standpoint, may be a highly important window into the structural framework of the Morgellons condition. It will also be found that deficiencies or disturbances of these particular amino acids correlate highly with symptoms that appear to frequently coexist with the condition, i.e., high oxidation levels and joint pains within the body. The prospect of this finding was first recorded in March of this year. Sufficient opportunity has been afforded to return to laboratory studies during the past few weeks and the original findings have been confirmed at a higher level. In the interim, a greater understanding of the likely molecular structure and bonding arrangement of the proteinaceous complex has been deduced, or at least hopefully this is the case. Sufficient resources, had they become available at an earlier time, would have rapidly advanced the painstaking studies that have brought us to the current state of knowledge. This state of knowledge remains in the majority, highly unfinished, but it is believed that an important level of progress has likely been achieved under the current work. The suffering is now deep and widespread amongst many, and haste must be made against the harm to health and spirit that has taken place. Interference (healthful) with the construct of the proteinaceous complex, along with a detailed knowledge of its molecular structure, remain as top priorities for future research. Adequate resources and support dedicated to those efforts will obviously advance those causes further and in due speed. A brief summary of how this result has been achieved is in order. The first stage of structural analysis involved the determination of the existence of iron within the growth structure. A comprehensive discussion of the methods used to establish this conclusion are described within the paper, Morgellons : A Thesis. The second stage of analysis involved the separation of compounds using column chromatography. This work has also been outlined within previous research papers. This work extended over a period of several months and involves a great deal of trial and error in the methods in conjunction with directed study and research. A primary result of this work was the repeated detection of a dipeptide form. 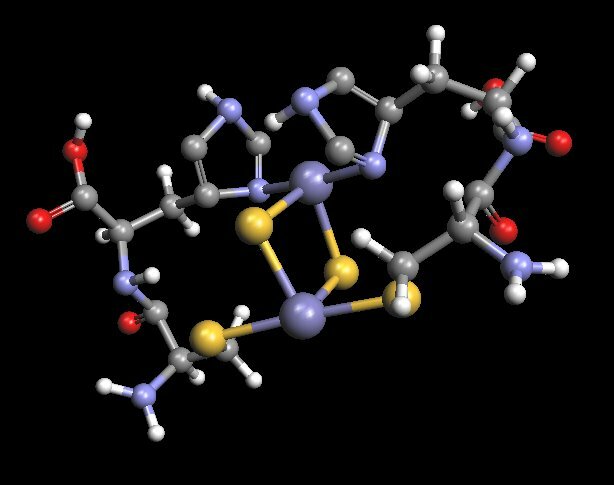 A dipeptide is a combination of two amino acids and it represents one of the most primitive forms of protein development. This conclusion was reached with extensive spectral analysis and it required detailed comparisons to such dipeptides as aspartame. The nuances of dipeptide spectral analysis are not easily researched within the available references and this is a topic of interest in its own right. These nuances are not practical to discuss within the objective of this report, but they involve subtle but important shifts in wavelength with the application of the Biuret test. One of the primary requirements of visible light spectral analysis is that the solution under examination must be colored. This is not a trivial issue, as most organic compounds are colorless. As such, it requires continuous search and investigation to develop methods of coloring the solution in a reaction the the compound under examination. In many, if not the majority of cases, no such transformation is available, period. These difficulties could largely be abated with the availability of infra-red and ultra-violet spectroscopic equipment, but such equipment is considerably more expensive to obtain. The need remains, however, as it has for several years, of more capable analytical equipment to continue these studies. Please contact the Carnicom Institute if you have an interest in this issue and furthering this research. The need after a dipeptide discovery is to identify the particular amino acids that compose it; it is known that there will be two. Several methods to pursue that goal were investigated, including additional column chromatography work, paper, starch and gel electrophoresis and extensive ninhydrin analysis. Lack of suitable equipment as well as the knowledge and experience base exist as additional limiting factors on the progress with these methods. This work has also been extremely time consuming, laborious and tedious and can be improved upon with suitable resources. The method eventually developed involves a combination of ninhydrin analysis and visible light spectral analysis. Ninhydrin is a chemical reagent that produces a colored result in the presence of amino acids and heat; one of the well known applications of this reagent is the detection of fingerprints within forensic science. Spectral analysis is a method that has availed itself to the more detailed examination of those color variations to provide unique signatures of various amino acids. Another aspect of this project has been the creation of a set of “reference spectra” using purchased amino acid compounds. Earlier work made reference to the candidates of discovery being cysteine and histidine within the dipeptide complex. This paper bears out this case, as will be demonstrated further below. The initial identification used the elute results of column chromatography. The amino acids extracted, after extensive trials and repeat trials, appear to be quite pure at this stage. This work is quite complex and requires a chain of solvents and solutes in combination with time and more time; there remains a great deal of work that can be done here to finalize the successful runs that have been achieved. The latter method that has been used is to work from the culture extract directly. This method has shown itself to be equally reliable and consistent and it has the advantage of eliminating or reducing the extensive and demanding column chromatography trials. It is, however, fair to say that the column chromatography results have been the cornerstone precursor to the interpretation of the direct culture extract results. The preparation of the culture extract is described to fair detail within another paper on this site, “Morgellons : The Breaking of Bonds and the Reduction of Iron”. Once the methods have been established to identify specific amino acids, the problem then becomes one of simply comparing an observed spectrum to that of a reference spectrum. This is the result that is shown below, both with respect to cysteine and histidine. The identification of the specific amino acids involved is one of the many crucial steps on the path of acquiring specific biochemical knowledge of the growth form’s molecular composition. This knowledge then forms the seed to interference and mitigation strategies that are to be developed to alleviate the suffering that is now in place. This same principle is certainly at the heart of most modern medicine. The additional restriction on the current need is that the strategies developed are to be based on improving the health of the body as well as being generally available and accessible to the pubic. The most common utilization of this information occurs in the hands of drug research related companies along with the profit motive at heart; this approach will not serve us well here. The reference and observed spectrums for cysteine and histidine appear below. The striking similarity and match is apparent in both cases. 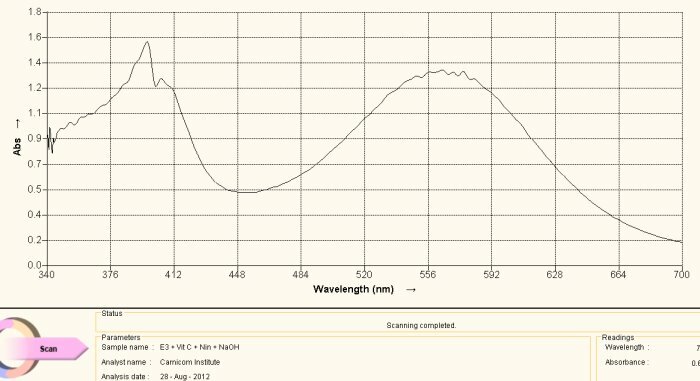 The peak absorbance wavelengths are the critical points to observe; amplitudes of absorbance can vary fairly widely with respect to concentration levels. 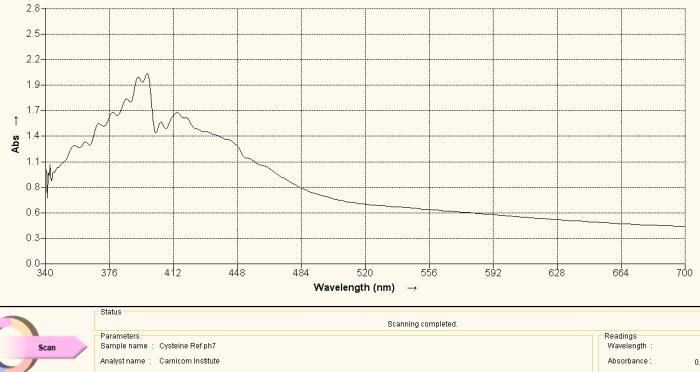 Peak absorbance wavelengths are quite unique in the identification of substances and are at the very core of spectral analysis. The uniqueness of the spectra below are self-evident and they form the basis for the identification of the two specific amino acids, cysteine and histidine, within the “Morgellons” growth form. 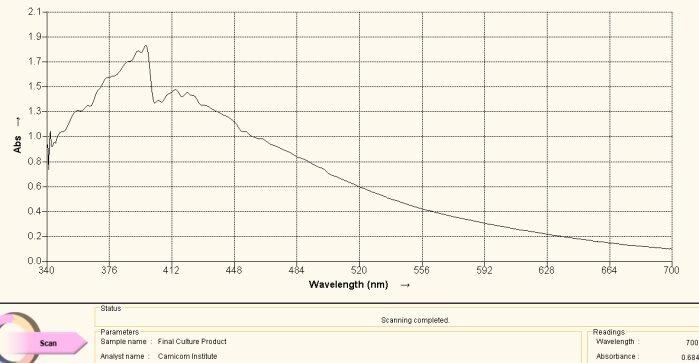 The above visible light spectrum is a reference graph for histidine, an amino acid. This spectrum was developed from a commercially available supplement form of histidine. The pH of the solution is an important factor in the developing color of the ninhydrin-amino acid complex. The pH of all spectra shown on this page are each developed in an alkaline solution. 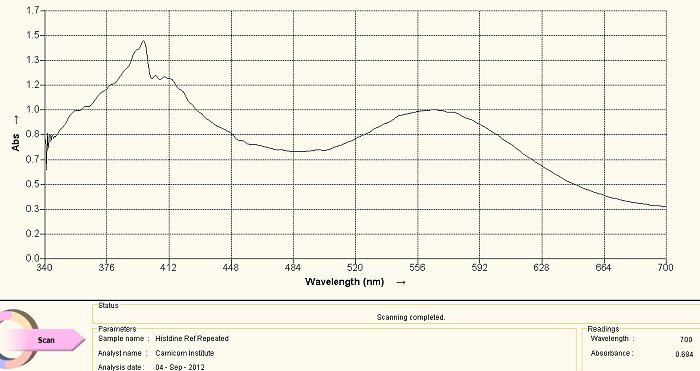 We notice the dominant peaks at approximately 400nm and at approximately 565nm characterize this spectrum. The method of development for the spectrum is as follows: a small amount (e.g, milligrams) of the histidine in powdered form in dissolved in water. A few drops of ninhydrin solution are then added as well as a few drops of sodium hydroxide solution to alkalize it. The solution is then heated in a water bath, usually for approximately 5-10 minutes. The color of the reaction of the amino acid with the heated ninhydrin in a basic solution will then develop to above. The alkaline solution reference is chosen because of the highly alkaline nature of the culture extracts, as they are themselves subjected to both heat and sodium hydroxide (lye) in the development of the extract. This spectrum above is acquired during the heating of the culture extract-ninhydrin combination. This color is a deep purplish color. The match with the reference spectrum of histidine above is evident, including the dominant peaks at approximately 400nm and 565nm. Spectra can vary substantially in magnitude with respect to varying concentration levels but the maximum absorbance peaks are much more dominant in their appearance. In this case we have essentially matched the spectrum in both magnitude and absorbance peaks. The conclusion from this spectra is that the culture extract itself contains histidine as a dominant amino acid and structural component of the growth form. The same argument is made in this section as above, with the exception of the amino acid under study being cysteine. Above is a reference spectrum for cysteine, also obtained from a commercial supplement form of cysteine. The preparation and methods of solution preparation are identical to that above. An interesting observation is that heating of the culture over time brings out two different color stages, the first that corresponds to histidine above and the second that corresponds to cysteine shown here. Histidine produces a purplish spectrum in alkaline solution with ninhydrin heat; cysteine produces a yellowish color in alkaline solution with ninhydrin and heat. This observation indicates that the release of the cysteine amino acid requires more energy than that for histidine, and this may be correlated with the disulfide bond strength mentioned elsewhere within recent reports. Once again, this is the spectrum obtained directly from the culture extract as subjected to an alkaline ninhydrin solution and heat. The match with the reference spectrum is evident and forms the basis for the second conclusion of this report, i.e., the existence of the amino acid cysteine at significant levels within the growth structure of the “Morgellons” culture that has been repeatedly developed. The molecular model shown above is an original proposal for at least some of the structural components of the “Morgellons” culture filament form. It is not to be assumed that this model is final in any fashion, as the equipment to ascertain such work is simply not available at this time. The model has been developed primarily through a combination of extended observation, study and deduction. 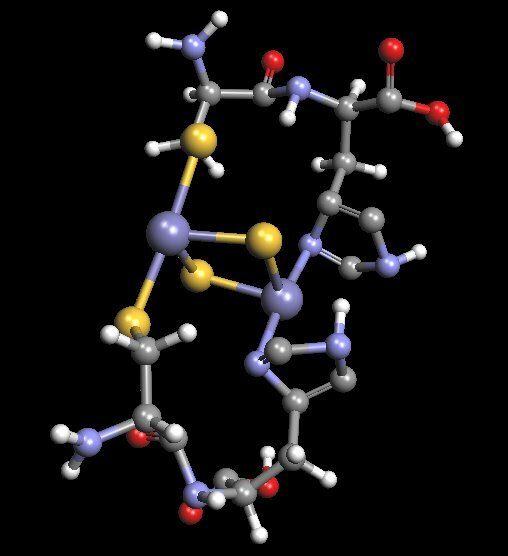 This model will be found to incorporate a dipeptide structure of both histidine and cysteine. Furthermore, this dipeptide has been extended by duplication in order to accommodate the iron-sulfur complex in the center of the structure. 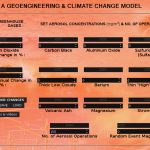 The model is to serve as a basis for further research should the proper equipment and resources become available. If and when the means to delve into molecular biochemistry techniques and equipment become available, this model can then be subjected to further scrutiny and development. The detailed knowledge of this biochemical structure, at the molecular level, is critical to the development of strategies that may potentially interfere with the growth of the organism. An alternate view of the molecular model that has been developed as a result of the extensive research and study on the “Morgellons” condition.